Hello! My name is Tanya Leontiev Duarte. 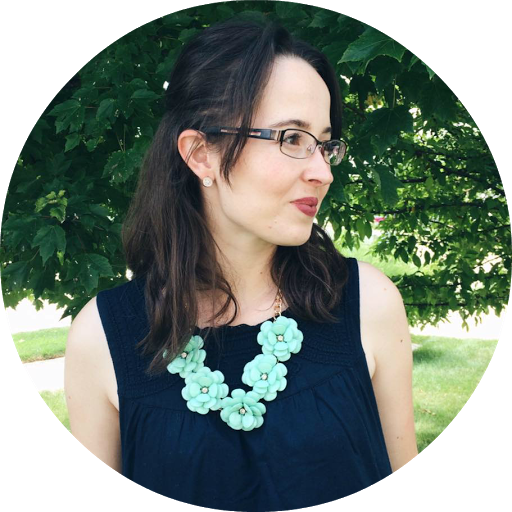 I want to thank Ashley for allowing me to be a guest on her blog. Thank you! I’ve been married to my husband for almost 25 years. We home school our 7 children together on a small farm in Oregon. Being a full time wife & mother, I found it pretty easy to begin an in-home business being a Young Living Essential Oils consultant & distributor. I am not a doctor. I’m self-taught in alternative, natural medicines, the ones used for centuries before modern medicine began introducing synthetics. The information provided in this blog post is for educational purposes only. It is not intended to prescribe, diagnose, treat, cure, or prevent any disease. It is the reader’s responsibility to educate themselves and address any health or medical needs they or their family may have with their physician. Please seek professional help when needed. In this post, I want to share some of the basics of how Young Living essential oils can help benefit the health of every living creature on the planet! (Yes! They even help pets!) I will talk specifically about the 10 oils found in the Everyday Oils kit & share testimonies of how they have helped with thousands of different issues. This (Everyday Oils) kit is the one featured in the Premium Starter kit, which includes 1 additional oil (totaling 11 bottles! ), plus several samples & a home diffuser! I will talk more about how to get your own Premium Starter kit AND receive a FREE, 488-page Quick Reference Guide for Using Essential Oils towards the end of the post. Before I was ever introduced to essential oils, I really had no concept of how they have been used throughout history & how they have played an important role in being man’s first medicine! Ancient records, dating back thousands of years, describe the use of these aromatics for killing bacteria, viruses, fungi, fighting off venomous bug & snake bites, treating all kinds of illnesses, & were even used in many religious rituals. One amazing discovery I read about was when scientists opened King Tutankhamen’s tomb back in 1922. They found about 50 jars carved out of alabaster that were designed specifically to hold 350 liters of essential oils! Only traces of the oils remained in the jars because the oils had been stolen by tomb robbers! Isn’t it amazing that the essential oils were more precious to these robbers than the gold that was also found in King Tut’s tomb? The most remarkable ancient documentations of essential oils are recorded for us in the Bible! It’s amazing to see how there are over 600 references in Scripture to the use of essential oils or the plants/bark/resin they are extracted from! That is a fact that really intrigued me when I got started in using them for our family. If they were considered more precious than gold & important enough to be included in Scripture, there MUST be something VERY SPECIAL about them! Here are just a few references from Scripture that stood out for me: Genesis 1:29-30 says, “Then God said, ‘Behold, I have given you every plant yielding seed that is on the surface of all the earth, and every tree which has fruit yielding seed; it shall be food for you; and to every beast of the earth and to every bird of the sky and to everything that moves on the earth which has life, I have given every green plant for food’; and it was so.” Ezekiel 47:12 says, “Their fruit will be for food, and THEIR LEAVES FOR MEDICINE.” In Matthew 2:11—Frankincense & Myrrh were given as gifts to Baby Jesus at His birth! And He was anointed with Spikenard before His crucifixion in the following passages: Mark 14:3-4, Luke 7:37-38, John 12:3. Then, at His burial, was wrapped in linens & a mixture of Myrrh & aloes in John 19:39-40. So what exactly are essential oils? And how can they benefit us? They are the essence or “life blood” of the plant, tree, fruit, flower, bark, seed, shrub, or resin from which they are derived. It’s what keeps a plant alive & able to fight off disease & heal its wounds. When you break off the leaf of a plant, you can usually smell its scent & see a liquid coming out of the torn area. That liquid is what helps seal off the “wound” of the plant & immediately begins to heal it. Essential oils are 100-10,000 times more potent than the dried herb version of the plant, making them wonderful additions to your kitchen’s spice rack & recipes! It’s been proven that Young Living carries THE largest variety & THE purest forms of therapeutic-grade essential oils IN THE WORLD! GUARANTEED! Therefore, it is not recommended that any other brand of essential oil be taken internally or topically, because most of the essential oils on the market today are only perfume grade &/or not processed in a way that offers the quality necessary to facilitate your body for healing! I’ve done a lot of research in this area because I wanted to make sure I was joining a company that I could trust & that could stand behind its products. I chose Young Living because it has been THE world leader in essential oils with over 20 years of experience in the field! They are the ONLY essential oils company that own their own farms! (9 farms on 5 different continents!) 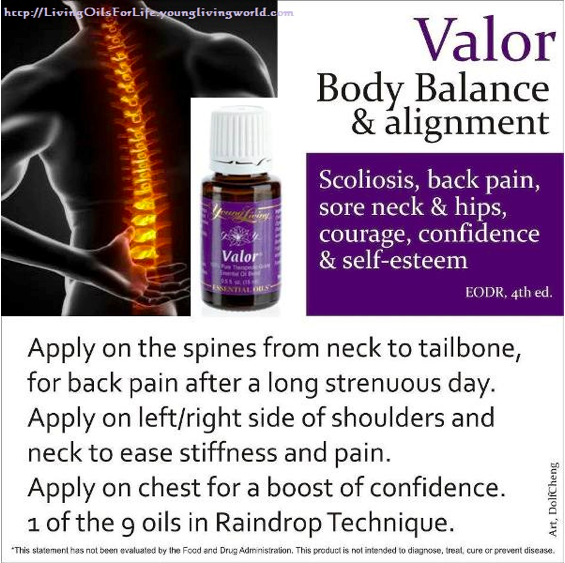 so they are truly the most dominant, trustworthy, & resourceful essential oils company on the market today. 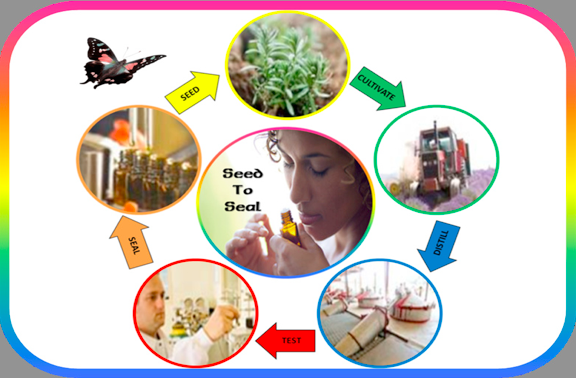 One thing that really stands out for me that no other essential oil company in the world can offer is that Young Living has what’s called the “Seed to Seal promise” (click here to read more about it: http://www.youngliving.com/en_US/discover/quality), ensuring that they know & can trace back right down to the very source of the seed, the soil, the cultivation, the distilling process, and the final product. It’s the 4 P’s process: Plants, Preparation, Purity, Potency. Through this Seed to Seal promise, YL is able to guarantee the finest & purest essential oils you can buy on the planet! Organic, virgin soil. Optimal harvest time. Small batches for distillation. No dilution! Extensive lab testing. Every step counts when creating the best essential oils and Young Living is there for every step of the process. Extensive testing is done to determine the best harvest time, best distillation time, and the best temperature! They own their own laboratories & have built their own distilleries. They are trusted by the Integrative Medicine community & over 50 hospitals across the U.S. regularly use YL essential oils for treatment on patients, including a birthing center here, in Bend, Oregon! 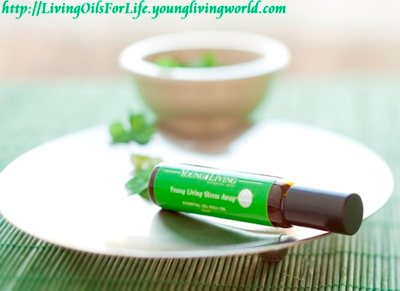 When stored properly, YL essential oils NEVER EXPIRE!!! No other essential oils company in the world can match their products or integrity & expertise in the field! 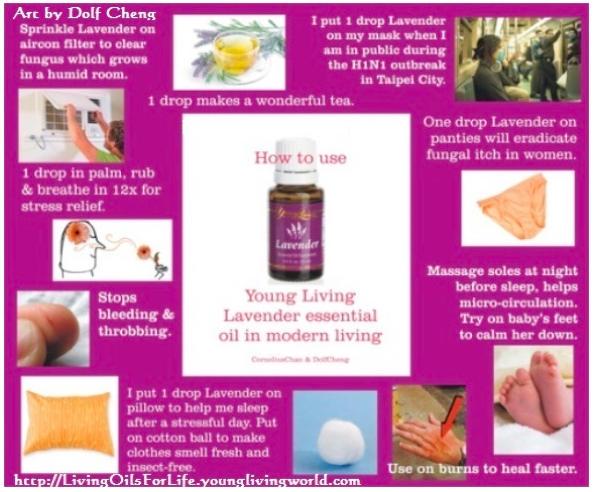 One person I read about used Young Living lavender on a burn and it was healed in no time. The next time she had a burn, she bought a different brand of lavender. This second, inferior brand gave her a chemical burn on top of her original heat burn! I hear of this happening all the time! It breaks my heart that people learn the hard way. Young Living is the BEST! They also have many other products including vitamins, minerals, protein drinks, and an amazing product called Ningxia Red that would need an entire class to cover all the benefits it offers! By the way, Young Living is committed to non-GMO & organic in everything that they produce! Did you know that prescription drugs are the 4th leading killer in the United States! Even when used according to a doctor's instructions, drugs can cause many nasty side effects. Next time you see a commercial on TV about some prescription drug, listen very carefully to the side effects listed toward the end! They are SCARY to say the least! The USA also has the highest levels of cancer, heart disease & diabetes in the world! This is alarming & should be cause for people to examine what we are putting into our bodies! In contrast, Young Living’s therapeutic-grade essential oils contain nature's design for enhancing and enlivening every type of system in our bodies: physical, mental, and emotional! That's why we need them now, more than ever! They don’t harm the good bacteria in our bodies (like antibiotics do!) but actually oxygenate & encourage our cells to help fight off infection & viruses! The more you use, the more your body will thank you! “Synthetic compounds may be copies of the chemical formulas of compounds found in essential oils, but they are lacking the subtle energies [life] contained in natural substances. Those who apply essential oils for healing soon learn that only pure, natural, complete, and unadulterated oils bring about healing, while synthetic oils, or oils adulterated by synthetic compounds, do not.” – Dr. David Stewart Ph.D., author of “Healing Oils of the Bible” (among several others!) & founder of C.A.R.E., which stands for Center of Aromatherapy Research & Education. You can find a bunch of great YouTube videos of his work by googling his name. The molecules of essential oils are so small, that they easily enter the blood stream directly through the skin when applied topically & can travel to every cell in the body in less than 20 minutes! Breathing in the essence of Young Living’s essential oils is another way to allow them to enter the body. This also has a profound, positive effect to the brain since it’s located a short distance behind the nose. Inhaling them increases blood oxygen levels, potentially enabling our bodies to recover from unexplained physical issues. It is now known through research & study that essential oils seem to have an “intelligence” about them that give them the ability to distinguish viral, bacterial & even cancerous cells from normal, healthy cells! Young Living’s Frankincense is derived from the gum or resin of trees that grow in the Middle East. 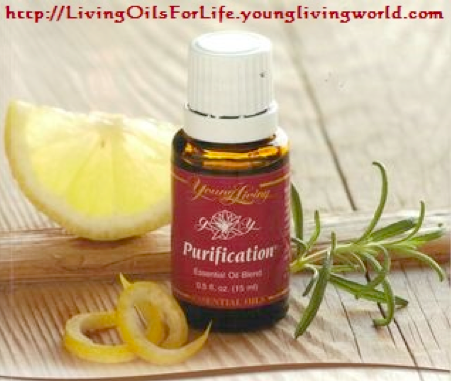 This oil is one that covers a lot of ground when it comes to healing! No wonder it is considered the “holy anointing oil” of the Middle East! Its medicinal properties include: anti-inflammatory, antitumoral, immune system stimulant, muscle relaxant, & antidepressant! 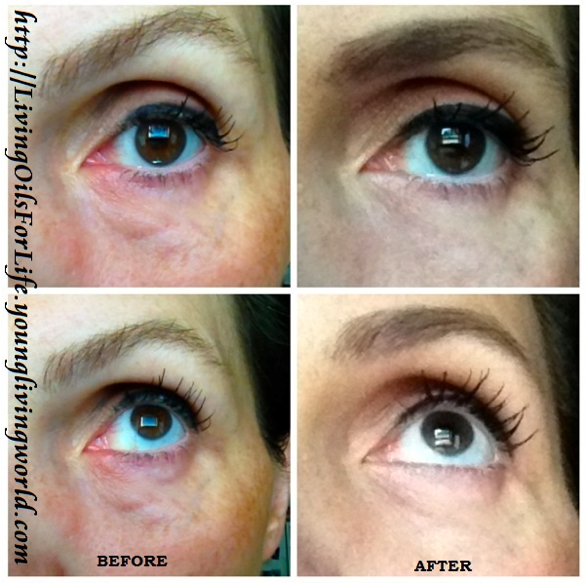 It also works wonderfully for cuts, scrapes, scars, cysts, skin tags, umbilical cord healing, wrinkles, & stretch marks! My son, pictured here, used it on his face after being in a snowboarding accident. 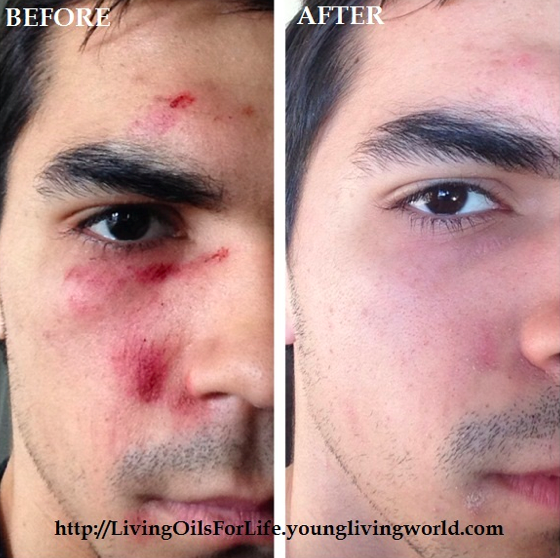 The after photo you see is only 1 week after he applied 1 drop of Frankincense everyday to his facial wounds! ￼ It is being successfully used in alternative cancer treatment protocols! I sat next to a lady who had been diagnosed with breast cancer & after having used the protocol that included YL Frankincense & other YL oils, she is now cancer free, enjoying life with her husband & 6 children! Frankincense has been a recent focal point in extensive research and is already being therapeutically used in European and American hospitals. ***Peppermint -- Wonderful for indigestion, stomach aches, reducing fevers, headaches, mental fatigue, muscle soreness, bug repellant, homemade peppermint patties (they are yummy!) & long-lasting breath freshener. Last year, when we were camping with two other families, one of their children (age 9 at the time) came down with a stomach ache that seemed to be something like a flu because she felt nauseous & like she was about to vomit! I rubbed Peppermint on her tummy, directly over the area that she was feeling the pain & on her feet & within fifteen minutes all of her symptoms disappeared! One drop of peppermint oil is equivalent to 250 cups of herbal peppermint tea!!! 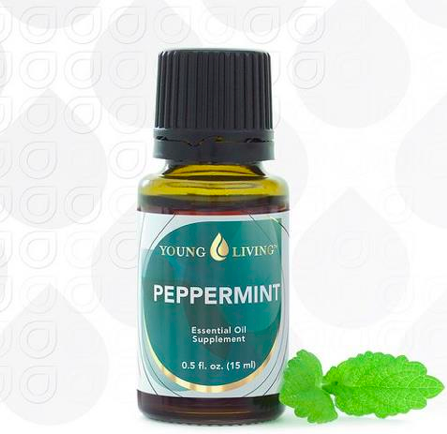 http://www.oil-testimonials.com/basic/peppermint A study performed by Dr. William N. Dember of the University of Cincinnati found that inhaling peppermint oil increased the mental accuracy of students by 28 percent! 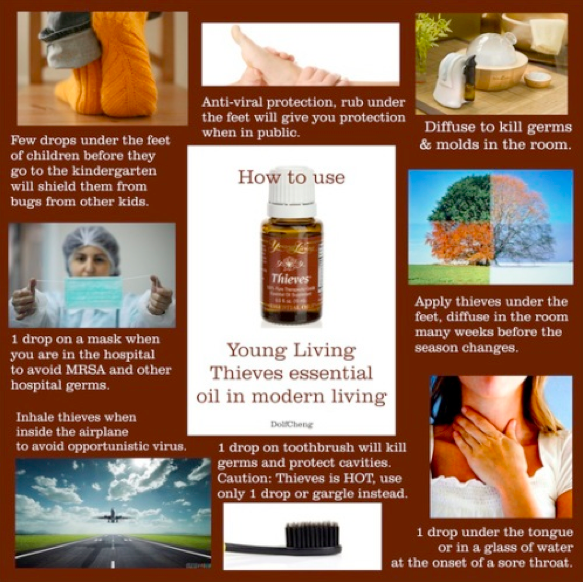 ***Thieves is an AMAZING blend of powerful oils!!! 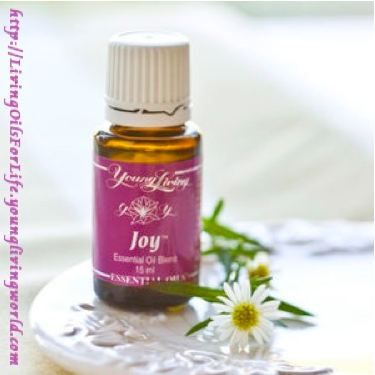 It is one of the most used oil blends in our home! There is a whole line of Thieves products that YL carries all of which are infused with the oil! I could easily do a post just on this topic! Young Living has Thieves toothpaste, floss, hand sanitizer, household cleaner (that’s so safe & totally non-toxic! ), throat lozenges, wipes & mouth wash. A friend’s husband had been told that he had an abscessed tooth that needed an expensive treatment plan to rid him of the pain he was experiencing. Before going through with the treatment plan, he decided to reach for Thieves! The pain disappeared within a day or two! You may be wondering why they chose the name “thieves” for this particular blend! It was created based on research about 4 thieves in France during the Black Plague outbreak, who covered themselves with cloves, rosemary, & other aromatics while robbing plague victims! This blend has been university tested for its cleansing abilities, effectiveness in supporting the immune system & overall good health! I love to use the Thieves household cleaner for everyday disinfecting in the bathroom & kitchen. It leaves everything smelling so fresh! It really feels good to have the peace of mind that it is non-toxic & I can safely use it around my children & pets! Stress Away is a bonus oil blend that is included in the Premium Starter kit. I love to wear this one as a perfume as well! It is excellent to help with headaches, calming anxiety, helping one to focus, and sleep issues. Moms really love to use this one when especially feeling stressed with the pressures of raising children & home making! 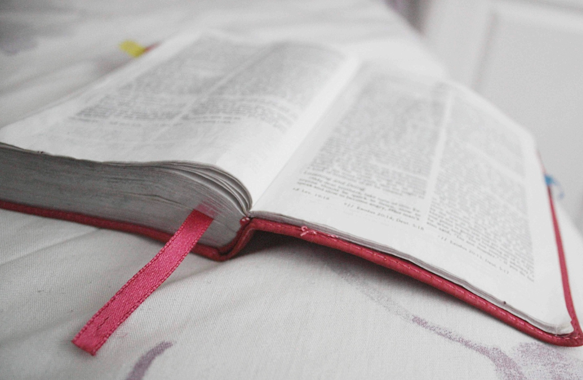 Did you know that God made our feet & hands to coordinate with every organ of our bodies? It’s true! The science of reflexology is based on a system of “zones” or reflex points that make up an image of every vital part of the body on our feet & hands. Working these points usually effect a physical change to a specific part of our body. 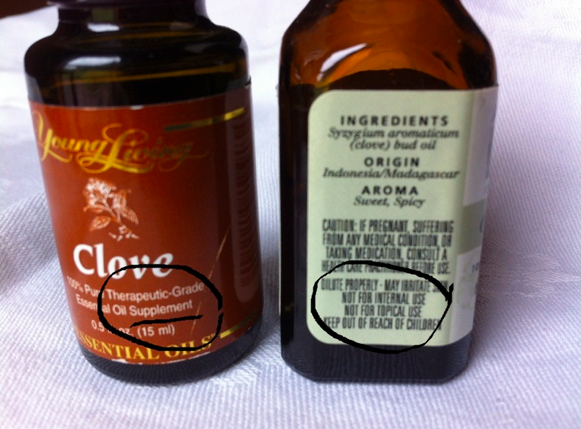 When adding in the use of essential oils, the effect is usually magnified! That’s why the bottoms of the feet are one of the best & safest places to apply essential oils to effectively produce results especially in very young children, even infants! For example, a young child who cannot yet swallow a gelatin capsule filled with a few drops of oil, (which is another effective way to administer the oils! ), *would* love to have their feet massaged with it instead! 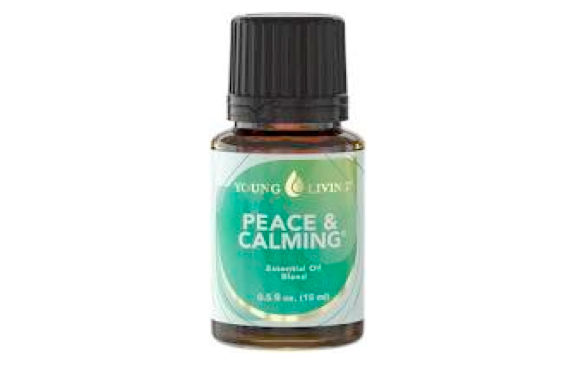 It’s very calming & relaxing & just as effective as taking the oil internally! Are you ready to experience health and energy and create a healthier environment for you & your family? 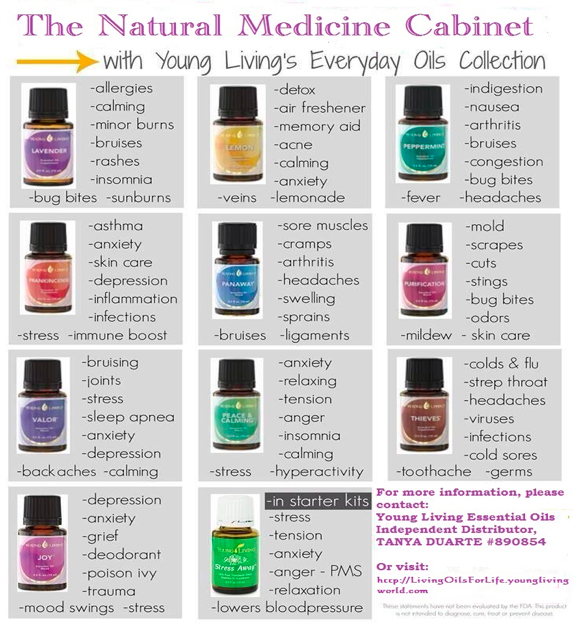 Do you see how these oils can benefit the overall health & well being of your family & loved ones around you? They have done nothing but BLESS my family & all those who I have had the privilege of introducing the products to! I can’t imagine our life without them! By enrolling as a wholesale member, with the one-time purchase of the Premium Starter kit, you enjoy 24% off of the retail price of every product! No monthly ordering is required! 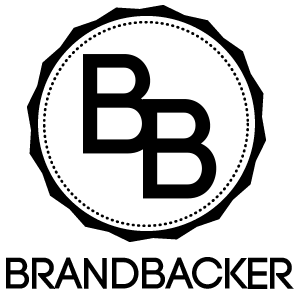 Only a $50 PER YEAR minimum purchase is required to maintain your wholesale discount. This is similar to your membership to Costco only you actually receive products with the upkeep of your membership! There is absolutely NO pressure to buy or sell! I’ve been a YL wholesale member/distributor since 2007 & at first, only joined with the intention to get the wholesale discount for use for my family, until I received my husband’s blessing to create a side income in 2012! Join my team and have access to support for use of your oils, and a business building team if you choose to create a side income for your family! IF you chose to order monthly, I highly recommend/suggest you get on the Essential Rewards program after you receive your membership! It allows you to accumulate points that can be redeemed toward FREE PRODUCTS!!! The first 6 consecutive months on the program, you will enjoy 10% of everything you buy put into your pool of redeemable points. From month 7 to 12, you get 15%. Then, from month 12 & beyond, you enjoy 20%. You will also enjoy a discount in shipping costs & the flexibility of choosing your own processing date! Your order can be adjusted each month to accommodate your budget & the changes in what products you need for your family as long as it’s done a day or two before your chosen process date. It’s a great way to try new oils each month! And, the order gets shipped to your doorstep every month! You can stop your shipments anytime you want, but that would cause you to lose your redeemable points. I’ve already accumulated more than $1000 worth of FREE oils!!! 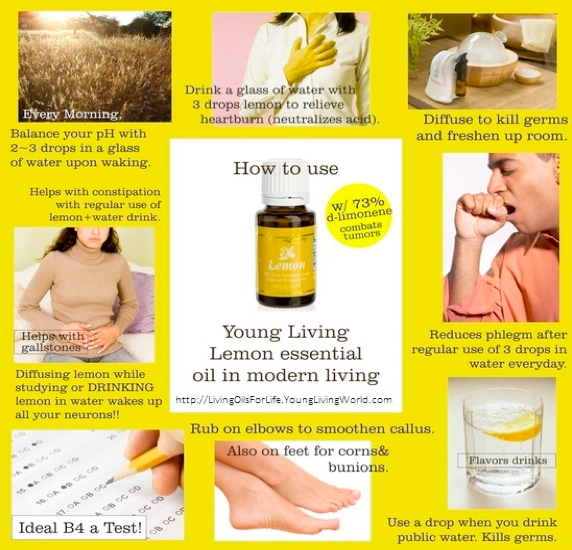 When you go to my website: http://LivingOilsForLife.YoungLivingWorld.com/ & click on the "Enroll Now" button to sign up as a wholesale member/distributor under my sponsor #(890854) with the purchase of a Premium Enrollment Kit, I will send you a "Quick Reference Guide for Using Essential Oils" as my thank you for becoming a Young Living wholesale member! 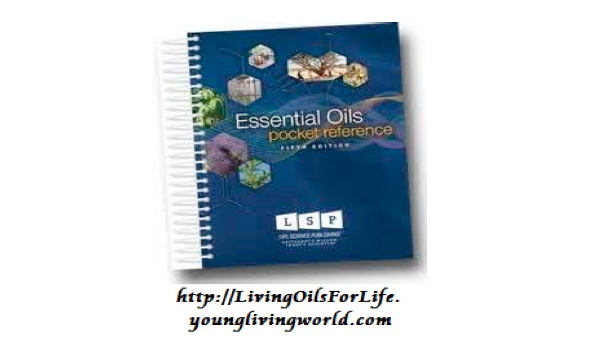 This 488-page book is an invaluable resource for anyone starting out & wanting to learn how to use these amazing oils! 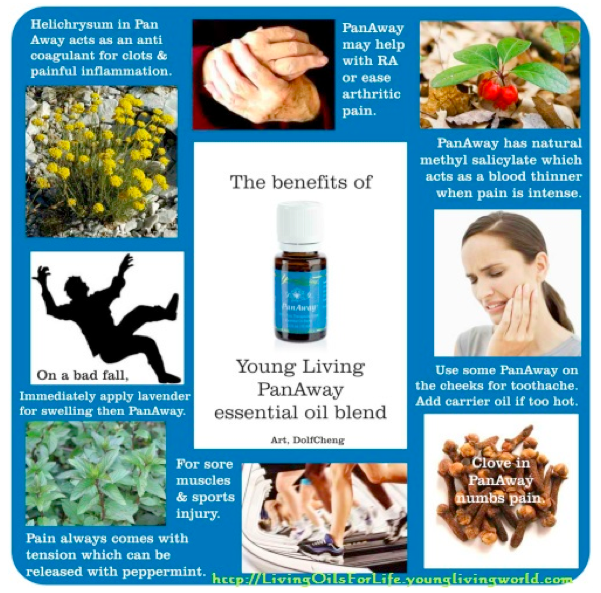 Also, please be sure to come on over & visit me at my Facebook page: Everyday Uses for Young Living Essential Oils!